The pasta sections of specialist Italian food shops can often resemble the contents of a children's toy cupboard. Indeed all those tubes and strings, and ribbons, not to mention the butterflies, shells and little ears are the stuff of dreams for fertile minds. They could allow the imagination to run riot in the kitchen, too. Well, that is if there weren't certain rules to rein in some of those artistic tendencies. The different shapes exist for a purpose, namely to complement the ingredients and consistency of particular sauces, an example being that old Anglo-Italian favourite spag bol. The city of Bologna that gives its name to the meat sauce is rather particular about its cuisine, and that includes the pasta that accompanies the sauce, or ragu. So if you want to impress one of the natives, you'll have to ditch the spaghetti and reach for some ribbons of tagliatelle. The reason? The flat surface of the latter is better suited to the sauce than the slender round strings of the former. But don't let that spaghetti go to waste - it's perfect for the Roman combination of eggs and pancetta, or bacon, known as carbonara. It does work well with pesto, too, but don't let a Ligurian catch you doing it because they serve their famous basil and pine nut sauce with short twisted shapes known as trofie. In truth, even the most pedantic of Italians is going to allow some leeway here and there but there are pastas that are synonymous with certain sauces. Take the Apulian combination of broccoli, anchovies, chillies and pecorino romano cheese which is popular through the south of the country. It really does work better with orecchiette, or little ears, because the concave shape holds the florets better. Or what about the Roman all'amatriciana of tomatoes, bacon and chilli twinned with bucatini so that the sauce can slip down the hollow as well as coat the outside of these long, thick strings of pasta. Providing the sauce with the ability to cling to the pasta is the reason why a number of the tubular varieties such as penne rigate are manufactured with a ridged surface. The spirals of fusilli perform the same function. In contrast the large tubes of dried cannelloni have a smooth outer surface because the sauce is held within its shell. Instead of ridges, a wider ribbon pasta such as malfadine (perfect for game recipes using hare or wild boar) sports a fluted edge to prevent the sauce dropping away off the sides. 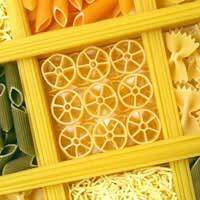 How many different varieties of pasta shape are there? Well, that's anyone's guess because each basic shape tends to be available in more than one size, take spaghetti and its younger brother spaghettini. Not only that, different regions have slight variations on the same theme or even the same shape under a different name. The good news is that any self-respecting cookbook will recommend the type of pasta that should be used for a certain recipe. And with all those imaginative shapes to match to different sauces, they provide a great way to get the kids out of the toy cupboard and into the kitchen. please send dry pasta ingredients please sendi am very thankful to you.